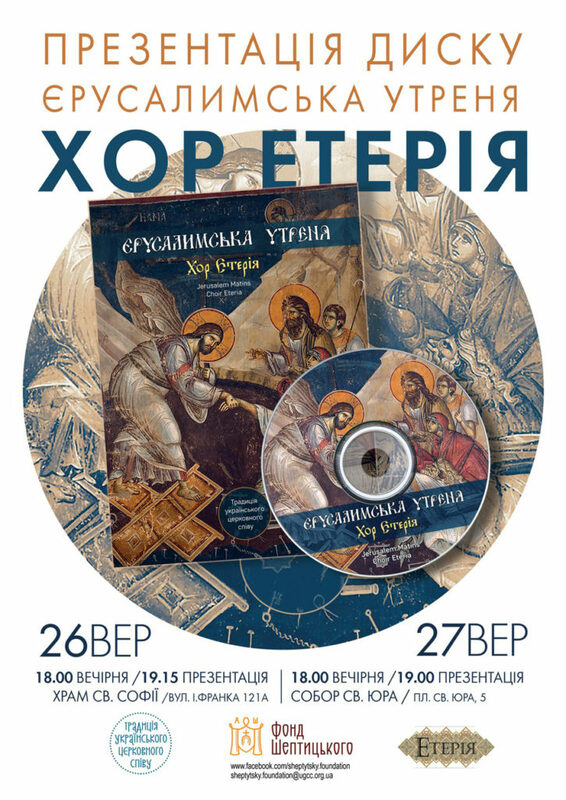 On September 26-27, 2015 the Ukrainian Choir Eteria presented recordings of Jerusalem Matins. Sheptytsky foundation has been supporting the release of recordings of traditional Ukrainian church music since 2012. The goal of the project is to revive and renew the tradition of Ukrainian liturgical music. Jerusalem Matins is the fifth release supported by the foundation. The work on this release has been arduous but fruitful. The project itself began with the theological study and translating of the religious manuscripts into modern Ukrainian language. The music sheets also had to be adopted according to the translation. The choir “Eteria”, which is based out of Catholic University of Ukraine recorded most of the tracks at St. Sophia Church. Jerusalem Matins is an unparalleled liturgy which is celebrated on the evening of Good Friday, or morning of Great Saturday. It its structure, the Matins is a prayerful vigil by the tomb of of our Savior. The religious poetry contains mourning and praising his life-saving death on the cross. The text is filled with deep theological content on life saving actions of the Son of God in light of his victory over death. Listen to on of the excerpts from Jerusalem Matins.